Conveying products in the medical and pharmaceutical industry requires precision and control. Medical and pharmaceutical products are small, lightweight, and fragile. That makes them difficult to handle, orient, and move. During the choice of conveyor belts for the pharmaceutical products clean room requirements also have to be considered, as do any space constraints. With the variety of pharmaceutical products within this industry, having proper conveying belt equipment is essential. These Conveyors are ideally suited for handling powders, granules, tablets, capsules and other pharmaceutical items, vacuum pneumatic conveyors can also be designed to deliver closures and moderate-sized containers to filling lines. Pharmaceutical conveyors are used to transport or convey medical / pharma related particles, raw materials or finished products from one place to another. Let our experience and unique solutions in the medical and pharmaceutical markets improve your processes and reduce costs. 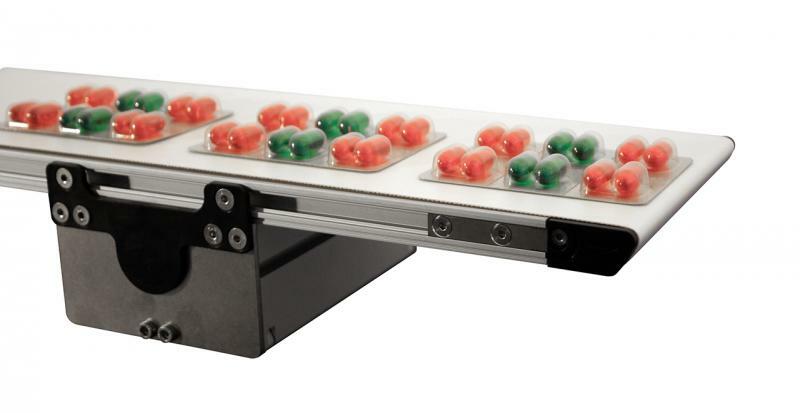 Conveyors are a critical part of pharmaceutical manufacturing, and there are conveyor manufacturers that understand this. Accumulation, high speed bottle filling and blister packaging, labeling, and tracking — all require conveyors that work quickly, precisely, safely, and cleanly. You don’t have to settle for a conveyor that doesn’t. TPU Polyurethane Conveyor belt - NA-786 - 1,30 mm This thermopolyurethane Conveyor belt is suitable for slicing machines, seafood processing, dairy industry, Fruits and vegetables , bread , biscuits and crackers: rotary cutters , chocolate bars, Pharmaceutics industry, pizza. This TPU conveyor belt has a thickness of 1,30 mm, and has 2 PET fa..